John & Kira's Business Gifts are fresh with organic ingredients. 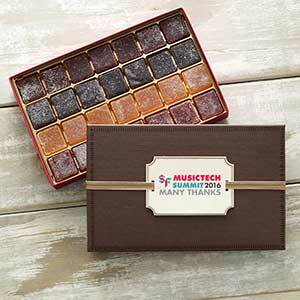 Customize our Irresistible Fruit Squares collection -- pâte de fruits perfected by an intense yet delicate recipe. Each gift carefully packaged, and may include customized Boutique Tag or Logo Card featuring your logo, graphic and/or personal message.